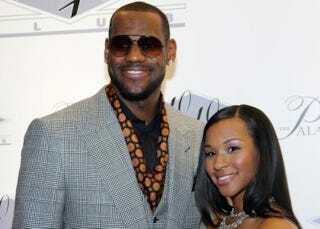 LeBron proposed to his long-time girlfriend, Savannah Brinson, at a joint New Year's Eve and King James birthday celebration last night. And she said yes! How romantic. A representative for James confirmed the news to The Associated Press on Sunday morning, a few hours after close friend Chris Paul and Miami Heat owner Micky Arison were among those tweeting their congratulations. The Miami Heat forward popped the question to his high school sweetheart on Saturday night, doing so at a party to celebrate both New Year's Eve and his 27th birthday, which was Friday. Congratulations to the happy couple and hopefully we'll find out just how, after so many years together, LeBron made such an important decision.